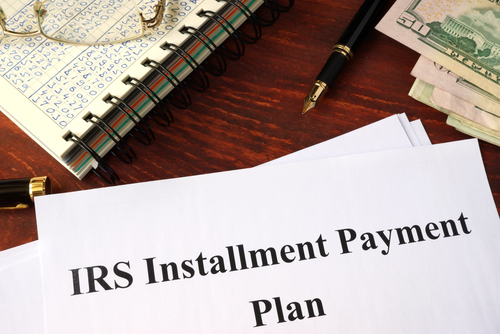 The IRS offers a variety of installment-plan options to help taxpayers pay their tax debt. Although it might be easier to pay the amount you owe in smaller increments, all installment agreements generate penalties and interest. Both short-term and long-term plans are available, depending on how much you owe, and special setup-fee options are available for low-income taxpayers. Thing’s aren’t looking good. You’ve hit rock bottom. Tax debts are at your doorstep and you have no way to make the payments — or do you? If that description sounds applicable to you, then keep reading to learn what you can and should do to improve your debt situation. No solution is going to be completely flawless, but installment payments could be just the thing you need to get back on your feet and get out from under mountains of debt. Even though you might feel quite desperate in your situation and experience a significant amount of pressure to start resolving your debt, you should still take your time to research and evaluate all your options. Before making a rash decision and submitting an application for an installment plan, you need to get all the facts. In this overview, we’ll go over the basics of how an installment agreement works, its benefits and downsides, and the conditions of different types of such agreements. If you’re in a situation where you simply do not have the money you need to pay the IRS debt in full and on time, then you may want to apply for an installment agreement. This payment option allows you to incrementally pay off your debt over time rather than in a single payment. If you just need some time to get your life in order, then that gradual payment could be a lifesaver. There are a wide variety of specialized plans available to you, depending on how exactly you want to pay and what you qualify for. Your eligibility will be determined by the amount of debt you owe and your unique circumstances, such as whether you owe individual or business taxes. Although you might have an easier time paying off your tax debt under an installment plan, there is one significant concern with installment payments that you need to be aware of: Late penalties and interest on the debt over time will still apply as usual. Ideally, you should pay your taxes by the due date in full to avoid any additional charges. However, if you absolutely need an extension to pay off your balance, be ready to take care of some mandatory fees along the way. You should also be very careful when negotiating your installment agreement. It’s possible that the payment plan you end up with won’t even go so far as to pay off the interest of the debt despite making regular payments. Make sure the amount you are paying leaves you with enough for living expenses but also lowers your debt over time. To minimize your penalties and interest, apply for an installment agreement as soon as you can and try paying off your debt as fast as you can manage. Also, keep in mind that the higher the debt, the more complex the application process and the qualification procedure. You are likely to pay greater fees and have less flexible agreement terms on larger debts as well. Many taxpayers get distressed when they have to deal with the IRS, fearing some harsh disciplinary actions from the agency if they make a mistake or default on their taxes. Although the consequences for not paying your taxes could range from penalties and interest accrual to garnishment of wages, escalating to legal action and imprisonment, the IRS usually tries to prevent such situations and prefers to work with people and businesses to resolve their debts. To accommodate various life and business scenarios, the agency offers several payment plan options. Depending on how much time you need to pay off your taxes and the amount of your debt, you might qualify for a short-term or long-term payment plan. The IRS also has special plans for businesses and high-debt individuals. As long as you have all the required documents ready, the application for most plans is quite simple and can be done online through the IRS website. For some plans, you might have to submit your application requests by mail or speak with the IRS directly. The list of the necessary documents will be different for each installment plan, so make sure to check the IRS website before you start the application. Before you apply for an installment plan, you should also consider a few other things. For example, you need to have all your tax returns for previous years completed. Also, you should carefully examine your current tax return for any errors or inconsistencies and speak with the IRS if you spot any. Consider hiring a tax accountant to help you make sense of various terms and numbers on your tax return. It is advisable to hire a tax attorney or CPA if your debt is $10,000 or more. If you’re an individual with less than $50,000 in debt owed to the IRS, you have the option of a short-term payment plan. With this plan, you will pay off your debt within 120 days. Regardless of how you apply for this plan (online or by mail), there will be no fees for the setup. Given that you should have your debt for a maximum of four months under this plan, you should only face one round of interest at most. Under the short-term installment plan, you may select yourself the amount to pay every month as it has no required minimum payment. There are also long-term payment options for individuals who need more than four months to clear their debts. The main difference between the two long-term installment payments is how exactly you pay your debt. If you wish to pay with direct debit through a Direct Debit Installment Agreement, you’ll apply online and pay the setup fee of $31. You’ll be charged $107 if you apply through the mail or by other means. If you want to make payments with something other than direct debit, then the online setup will cost $149 and $225 with any other method. As a side note, if you classify as a low-income taxpayer, you may be able to mitigate, waive, or reimburse the setup fee for the long-term plans. With all individual plans, you can decide for yourself how much you intend to pay each month. However, even the long-term plans have a limit on how far they can last. Currently, that limit is six years. If you want to know the minimum monthly payment, take your total debt and divide it by 72. You can always pay more than the minimum if you want to. In fact, it’s advisable to do this as long as you can afford it. By making larger payments, you will reduce the amount of interest that accumulates over time on the debt. When your debt to the IRS is above $50,000, that’s when things become significantly harder. Typically, it takes quite some effort to qualify for a high-debt installment plan. Even the qualification process will take time, during which the IRS in perform a thorough investigation of your life and finances. Also, such plans are a lot more complex in their setup, so you won’t be able to apply for one online. Rather, you will have to submit your application and any required documents by mail. You might also have to do some digging to supply the IRS with the various documents they might request. Unlike the previous installment agreements, you will be required to fill out Form 433-F, Collection Information Statement. This form will ask you to provide information about your household, assets, income, expenses, and the like. After this comes your negotiations with the IRS. You want to have an installment agreement go through, and depending on how dire your situation, you may have to negotiate for a plan that works for you. Make sure the IRS has everything it needs from you. This includes tax returns, payroll tax deposits, and any other financial statements that are necessary. Don’t promise to pay more than your income minus your living expenses. Missing a payment is the very last thing you want to happen. Whatever your proposed monthly payment is, try to send that amount in every month while the collector is still mulling over your plan. If you demonstrate your ability to make the payments, then it will be easy to convince the collector that your proposal is viable. In your Form 433-F, you may have provided living expenses that the collector deems to be out of your means. Until you cut back on some of the more lavish expenses, it will be difficult to prove to the IRS collector that you are making the most efficient payments. Details in your Form 433-F do not truly represent your income or your assets. If there is some evidence that you were not being transparent with the IRS, then it will be difficult to get their help again. You’ve failed to meet your payments on a past installment agreement. If you have a poor track record, then the burden of proof is going to become all the heavier in the eyes of the collector. If you find yourself short on resources to pay your taxes in full when they are due, one of the IRS installment payment plans might be a great option. Not only will it give you more time to repay your debts, but it will also help you stay current with the IRS, avoid charges due to delinquency, and thus prevent you from getting further in debt. However, installment payments are not the best path for everybody in every situation. If your incremental payments are too slow, then you’re going to find yourself having trouble keeping up as the interest piles on. Still, it is a tool available to you if you don’t see any better way forward. Take some time looking over different payment plans and their conditions and honestly evaluate your financial situation before applying for and committing to any plan. Whether your application gets approved by the IRS and whether you can keep up with your installment payments will depend on how thoroughly and thoughtfully you approach the process. If, for example, you’ve overestimated how much you can afford to pay monthly, you can easily default on your payments and accrue additional charges. If, on the contrary, you’ve underestimated your capability to pay and applied for a long-term plan when you would be fine with a short-term one, your application will be rejected. Although the IRS has different payment options to accommodate various debt situations, owing taxes is a serious issue and should not be treated lightly. No matter how much you owe, and especially if your tax debt is significant, consider taking advantage of all the online resources and education on the topic as well as consulting with a tax professional. Even though it might be challenging to keep your spirits up when the weight of debt is bringing you down, try to use this time to gain expertise in the matters of debt and sound financial sense. Such knowledge and insights will prove indispensable for staying debt-free in your future life. The best way to know how to move forward and free yourself from debt is by listening to professionals. We here at Solvable can help you not only get out of debt, but we’ll also equip you with the tools to make your journey as smooth and as fast as possible. Come and see our reviews of debt relief companies and get yourself a free consultation. We also have many more articles to help you with any of your debt troubles. Next PostNext How Long the IRS Can Look Back to Audit Mistakes?